Children learn most of the stuff through experience and they experience through their senses. Hence. 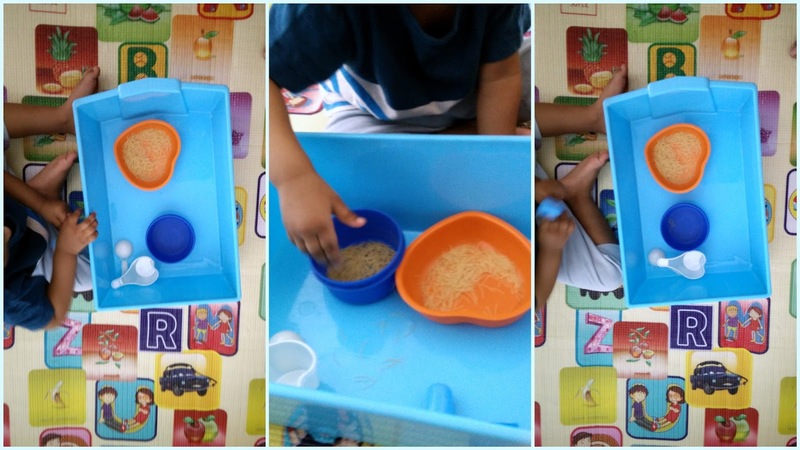 sensory play forms an important role for toddlers. Let the child explore all types of material around her. A toddler is sure to feel amused and excited at the wide range of items present around her. All her activities are always coupled with me doing the talking. I tell her what each item is, how it feels like, how she can handle it etc. 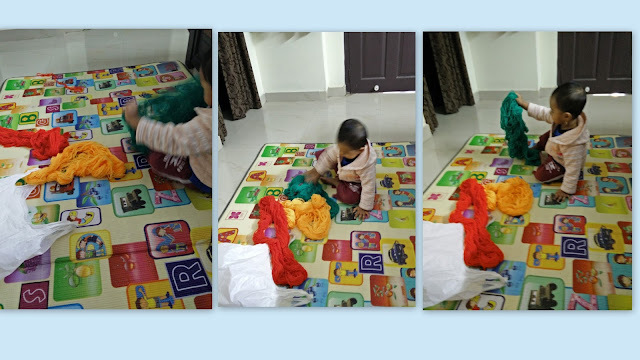 Let the child experiece how wool feels like by giving her a couple of colours of wool yarn. My child screams 'Baa Baa' upon posing the question 'Who gives us wool?'. My child just loves to play with foam. She has fun in her bath time. I place some foam on her palm and ask her to look at it vanish gradually and she exclaims at it. Offering foam as a play activity is not that bad an idea. 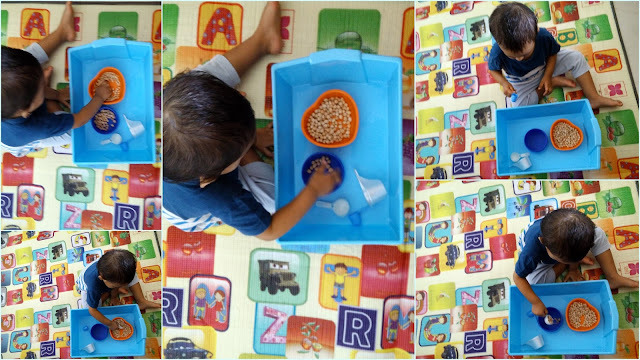 My toddler first started with transferring foam from one container to the other. Then it is time she put her hand, took some in her hand and noticed the bubbles going off gradually. Next, she smelled the foam. I notice she smells most of the things I offer her, may be true with other kids too. Who doesn't love playing with water? There are umpteen ways a kid herself can engage when placed in a pool of water. 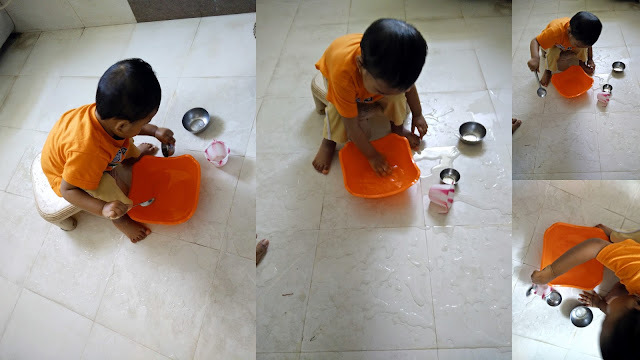 This one is a simple one in which child just transfers water from one container to another using spoon, bowl and observe how water holds in it. My child also poured water in her palm and was amazed at the fact that she can actually not hold water! This, this minute detail is what we need to teach kids. Of course, a toddler may not be able to understand the scientific theory behind water being a liquid state of matter and so on. The activity may be repeated with every growing phase and the kids understands more in every phase. Moong also known as green gram, feels soft and are hard when eaten raw. This play teaches texture, art of holding tiny seed-like things and can be used as one of the sound-shaker items that teaches various types of sounds. 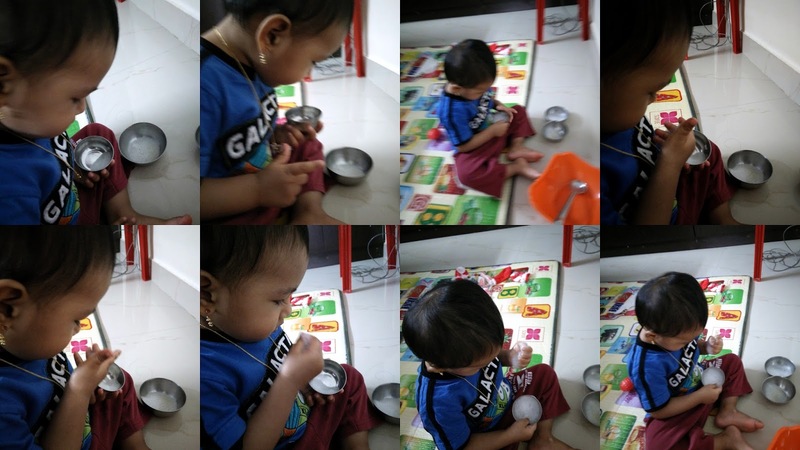 I first asked my child to transfer moong from one container to another using each of the spoons provided. 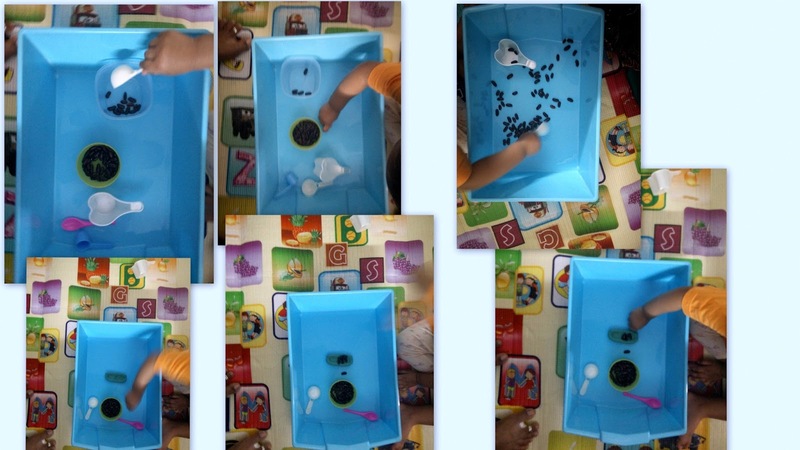 She tried with all of them and zeroed in on the blue scooped spoon for the rest of her play. After quite a while, I asked her to use her hand to transfer the moong. That is when she could actually feel and was surprised at the tiny things. She also just waved her hand furiously within the tray to see all the moong getting scattered here and there. Also, she emptied the entire container into another and exclaimed at the sound. Next is when she wanted to taste it and I explained they were really hard and we cannot eat them raw. This one is similar to #4, just that, kidney bean is little larger in size than moong. My child played in a similar manner. Also, I prepared a tiny try out of clay that could fit just one bean in its width and asked my child to place the beans one by one in the tray. I offered my child some loose cotton and observed as she was holding while playing. She pulled out pieces of cotton out of a lump and then joined all the pieces back. I also gave her a glass of water and asked her to dip the cotton in water. She dipped it in water, pressed the cotton ball, noticed that some water poured down a wet ball and she also wiped her mouth with the wet cotton!! Isn't it interesting? The next three activities are similar to that in #4. 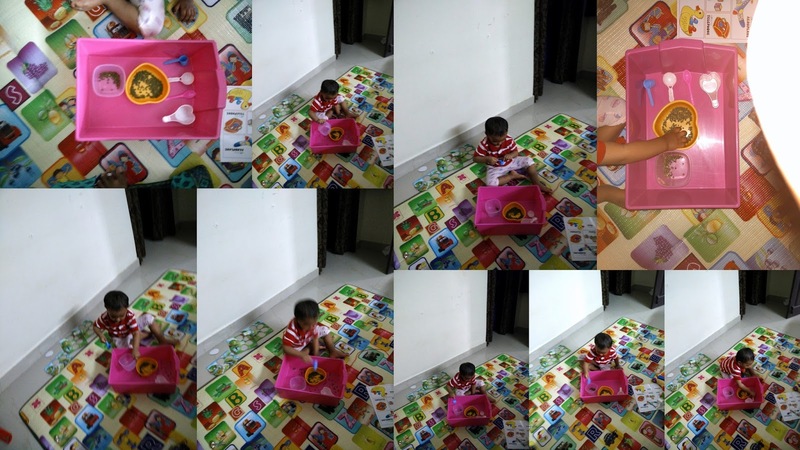 Main point is that the way child feels and reacts when handling various items will be different. This has to be noticed and child should be encouraged to find and feel any specific thing in each of the activities.